Ba mhaith liom buíochas a ghabháil leis an Cheann Comhairle as ucht an deis seo a thabhairt dom an cheist seo a ardú. I thank the Minister for Education and Skills, Deputy Quinn, for coming into the House to address this matter. It is not just appreciated by myself but the people I represent that he is engaging with us on this level. Like other towns across the country, the population of the greater Clonakilty area has grown over the past decade. Similarly, it will face challenges in acquiring the necessary infrastructure to meet the educational needs of future generations. Clonakilty Community College was designed and built to accommodate 400 students but now has over 600 students enrolled. The school has a shortage of science laboratories and a critical lack of other facilities which would lend themselves to good teaching practices. Along with the health and safety implications of this aspect of overcrowding, the school relies on an old vocational building at the other end of the town to accommodate overflow classes which means students must traverse the very busy town centre to get to classes at the different sites in all sorts of weather. This also poses difficulties to school management when timetabling classes. An extension to the college has been promised for the past ten years. Just ahead of the 2002 general election, the appointment of a design team for an extension to the college was announced with great fanfare by then Minister for Agriculture, Food and Forestry, Joe Walsh. The promise was repeated again before the 2007 general election with the same ministerial letter confirming the appointment of a design team doing the rounds. As of yet, however, nothing has materialised. While the extension is on a list of schools building projects for progression in 2011, I have not been able to ascertain any real movement from the Department. Will the Minister give some political assistance to progress this important project? Being a realist, I accept the Department has a limited capital works budget of €440 million for next year while the Minister has 180 individual requests on his desk for schools building projects. However, Clonakilty Community College, its students, their parents and staff deserve better after a decade of false promises and disappointment. 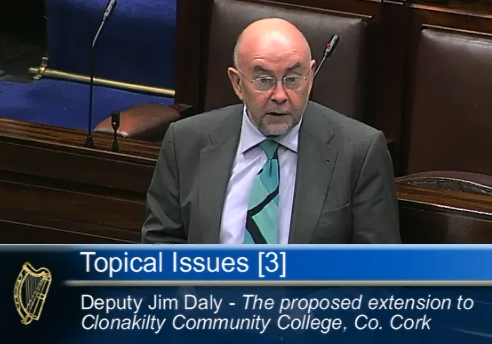 Will the Minister engage with his officials to progress this overdue extension to accommodate future generations of students in the greater Clonakilty area? Five similar projects in County Cork have been devolved to Cork County Vocational Education Committee already this year, all of which are progressing satisfactorily. Will the Minister consider such a move in this case to facilitate it moving on to the design stage? I thank the Deputy for raising the matter as it provides me with the opportunity to outline to the House the Government’s strategy for capital investment in education projects and to clarify the current position of the application for major capital funding from Clonakilty Community College. Unfortunately, the culture of promises for schools building projects is corrupted. Pledges going back to the 2002 general election and reiterated in 2007 have confused many communities. One of my objectives is to provide absolute clarity on all projects in early January 2012. If there is bad news, so be it. We need clarity rather than obfuscation which only misleads people and generates hopes which are later dashed. The Department of Education and Skills forecasts an increase of over 25,000 post-primary pupils by the start of the 2018 school year. This cohort will continue to grow until 2024 at least. In the first quarter of this year 19,950 babies were born, the highest number of births since the quarterly series began in 1960. The demographic challenge is enormous. To meet the needs of our growing population of school-going children, the delivery of new schools together with extension projects will be the main focus for capital investment in the coming years. We must ensure every child born this morning will be looking into a schoolyard, not into a field, several years from now. Clonakilty Community College applied for major capital funding for an extension. The application was assessed and assigned a band 2.4 rating. Under the Department’s assessment process, a project is assigned a band rating under published prioritisation criteria for large scale building projects. These criteria were devised following consultation with the education partners. A building project moves through the system commensurate with the band rating assigned to it. There are four band ratings overall, of which band 1 is the highest and band 4 the lowest. The school’s extension project was included in the announcement by the then Minister for Education and Skills January 2011 – we knew what we were heading into then – which stated, “where briefs will be formulated in 2011 and the process of appointing a design team will commence”. This is the third time the college has been told a design team would be appointed. In this regard, it is intended to review with the school the long-term pupil enrolment. The plans for the school also envisage the provision of accommodation for an all-Irish unit. The next step will involve a site visit by the Department’s technical staff which is envisaged to take place in the coming weeks. The Deputy may update me on this when he responds. Following the visit, a schedule of accommodation for the school will be drawn up. When this process has been completed, the appointment of a design team can commence. We have no choice but to respond as a matter of urgency to the increasing cohort of school-going children. Without making any commitment on this matter, I can only see this project advancing if Deputy Jim Daly’s community can demonstrate a long-term pupil enrolment in the area. I appreciate the Minister’s response and forthright attitude to dealing with it up front. I will take on the challenge of engaging with departmental officials and the Minister to prove the college’s case. I acknowledge the efforts of the college’s parents’ association which lobbied extensively for this building project. It has been bitterly disappointed in the past. I am not proud as a politician of how the parents’ hopes have been dashed. It is no wonder politicians have a bad name. I also commend the school’s management, current and former principal and the staff who have put much time and effort into getting this project progressed. A site visit has not yet taken place. I will get back to the Minister and his officials about the demographics for this project and continue to engage constructively to progress it. Regarding the Deputy’s other question about VEC involvement in the project, due to the sheer scale of the task of delivery on school building projects, the Department has requested VEC assistance to accelerate delivery on the ground. It should not be taken that this will happen in this case. However, it must be recognised the VECs are performing excellent work in this area. The Taoiseach has commented previously on the role of the old Army barracks in Monaghan town. The way forward for the Deputy’s community, and the school to which he is clearly attached, is through the mechanism of population growth. That will be the overriding criteria.